At front in the Great Bridge Lock. Not much level change here. 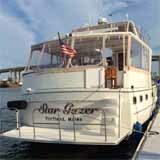 We are at Salt Ponds Marina on the Chesapeake, 18 miles further north than we have been before. We got through the bridges quickly. Traveling on Saturday helped at a couple of bridges that open more quickly on weekends because of less auto traffic. We were behind a large tow at one of the bridges. It took forever to go through, so by the time we were there the cars were lined up a long way on either side. We hit the Great Bridge lock as it was open on our side so sailed right in to the front where we waited for more boats behind us. There were a big group of Coast Guard people at the lock who took the opportunity of all those boats being stopped to board everyone for a safety check. We had been checked less than a year ago but of course I could not find the paper from the previous boarding. They were a lot quicker than last time, when they traced all our plumbing. They were off us only a few minutes after the lock gates opened but still had to do the boats behind. The boats going the other way waiting to get in may not have been to happy about their delay. Steel Bridge had been taken down, replaced by a 65’ clearance fixed bridge. That was great news. We hit that one a little late on our way back from Norfolk last year and waited 55 minutes. 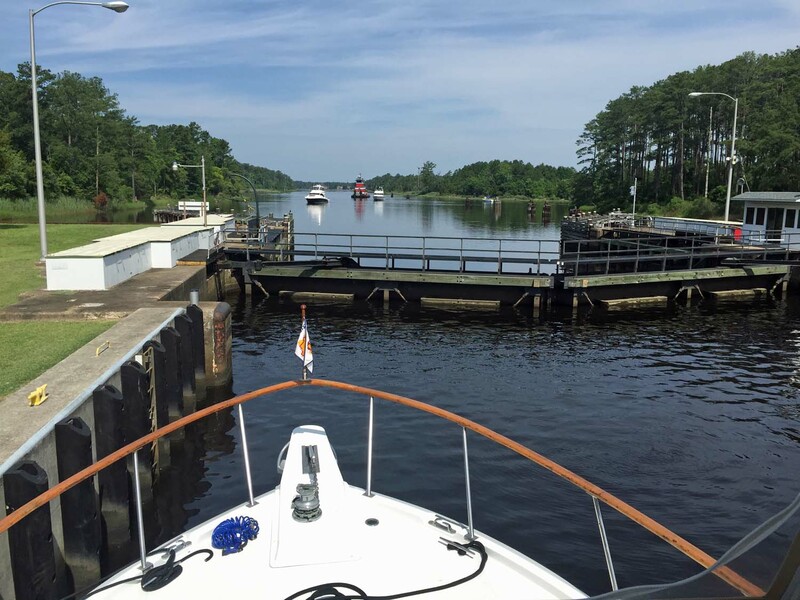 I don’t think we were delayed more than 30 minutes by bridges and locks, even with the Coast Guard thrown in, so we sailed 18 miles past mile marker 0 at Norfolk and out into the bay. Navy ships as we leave the Elizabeth River into the Chesapeake Bay. Our first bay experience was great, with little or no waves. The only drama was our first back in docking with our guests. The slip width was 1.5’ wider than our boat. As I backed in Keith, Gayle and Sue were all shouting directions to me. I should have set things up with them in advance, and since have asked Keith to take charge. A big storm is supposed to come through here tonight (Saturday night) and small craft warnings are on the bay for tomorrow. Wave height is to be 3 to 4 feet, the short period kind that rock us easier. I’m a little reticent about travelling open water for whole day, so we’ll wait an extra day here for that to pass, and leave on Monday.